The Wake Up Project: Days Away From Economic Chaos? America is just a few days away from a possible day of reckoning. I again call attention to this day, August 25, when the Federal Deposit Insurance Corporation issues its 2nd Quarter report for 2009 on the state of health of American banks. It has not particularly alarmed Americans that its growth and prosperity have been built upon debt. The American public is a bit desensitized, particularly since the Y2K threat fizzled. We must wait and see how Americans respond to the upcoming FDIC report. "The failure of 77 banks this year is draining the fund, prompting the agency in May to set an emergency fee of 5 cents for every $100 of assets, excluding Tier 1 capital, to raise $5.6 billion in the second quarter. The agency has authority to set fees in the third and fourth quarters, if needed, to prevent a decline in the fund from undermining public confidence." Vekshin goes on to report that 56 bank failures since March 31 have cost the FDIC an estimated $16 billion. (For comparison, in the 1st Quarter, bank failures only cost the FDIC $2.2 billion.) That $16 billion bank rescue would fully deplete the FDIC fund as it only had $13 billion at the close of the 1stQuarter. It’s possible the FDIC has already tapped into its line of credit at the Treasury Department without setting off alarm bells to the public. The FDIC's 8400 banks will likely be assessed special fees to shore up the FDIC's treasure chest. Bloomberg’s Vekshin, quoting Robert Strand, a senior economist at the American Bankers Association, says the industry will pay $17 billion in premiums this year, including $11.6 billion from the annual fee. The following chart shows the aggregate profits of all 8400 FDIC-insured banks, which is about $5–7 billion per quarter. This figure is AFTER the banks have set aside funds for anticipated losses in real estate loans. Insured institutions set aside $60.9 billion in loan loss provisions in the 1stQ, an increase of $23.7 billion (63.6 percent) from the first quarter of 2008. Banks have been slow to foreclose, allowing mortgage holders a few months before their home is deemed in default and giving another 2 years before the property is foreclosed on its accounting books. This practice has been able to temporarily hide most of the banking collapse. But banks must eventually write down their real estate home mortgage losses. First-quarter net charge-offs of $37.8 billion were slightly lower than the $38.5 billion the industry charged-off in the fourth quarter of 2008. You can see by the following chart that US banks are directing a great deal of their profits towards write-offs (loss provision in the following chart) for non-paying home mortgages (foreclosures). So the banks only have about $5–7 billion of profit to direct to the FDIC to shore up its quickly vanishing reserve account. This aggregate profit equates to about $890,000 profit per bank in a quarter. That is a pretty thin margin. The FDIC, which claimed only about 300 problem banks in the 1st Quarter of 2009, but hid the fact there were about 2000 total lame banks among its 8400 members, This has given rise to the term "zombie banks," which are defined as "a financial institution with an economic net worth that is less than zero, but which continues to operate because its ability to repay its debts is shored up by implicit or explicit government credit support." Examination of the following FDIC chart shows geographically that most banks are not making a profit. So just how much liability does the FDIC bear aggregately for its "problem banks?" At the end of the 1st Quarter in 2009 the FDIC said that figure was $220 billion. Remember now, the FDIC had only about $13 billion to over these institutions at the time. (See chart below) This figure will likely grow beyond imagination with the issuance of the FDIC 2ndQ report. How do American banks make profit today? So how to American banks make any money today? You can see in the following chart that in the recent past American banks derived most of their profits (45%) from residential and commercial property loans. These income sources are obviously crashing. Sharply higher trading revenues at large banks helped FDIC-insured institutions post an aggregate net profit of $7.6 billion in the first quarter of 2009. Trading revenues means profit generated from trading stocks and other risky investments. Recall, when your money was being financed commercial and residential property it had some collateral behind it. An asset (real estate) was held in balance against the risk of failure to pay the loan. Now bankers are "investing" your money in the stock market in what appears to be a replay of how the Japanese propped up their stock market in recent years – by simply having major companies purchase each other’s shares to prop up value. The FDIC's 1stQ report says: "Total equity capital of insured institutions increased by $82.1 billion in the first quarter, the largest quarterly increase since the third quarter of 2004 (when more than half of the increase in equity consisted of goodwill)." What the hoot is "goodwill" you want to know? It is how the banks are cooking their books. Arbitrary value is being given to bank holdings. Most of the aggregate increase in capital was concentrated among a relatively small number of institutions, including some institutions participating in the U.S. Treasury Department’s Troubled Asset Relief Program (TARP). So there, you can see that in addition to goodwill, the bank's capital was largely increased by bailout funds. So a dose of reality therapy will lead one to conclude that nearly all American banks are essentially insolvent. If this leaves you feeling a bit queasy, well, you may need to reach for Dramamine when you realize the FDIC is not only broke, but it will probably announce it is tapping into its line of credit at the US Treasury Department, which is also insolvent (America is spending $1.58 trillion more than it collects in taxes this year). American banks weathered the savings and loan/real estate appraisal crisis in the 1980s and 1990s by loading from the US Treasury. In 1991–92, during the last part of the savings and loan crisis, the FDIC borrowed $15.1 billion from the Treasury and repaid it with interest about a year later. But just exactly how will American banks ever pay back the treasury while facing years of write-offs from home mortgages? The banks do not have sufficient profits to offset their losses. The entire cost of the savings and loan crisis of the 1980s and 90s was finally calculated at $153 billion, which was four times the reserves held by the FDIC (FSLIC at the time) in 1982. Of this, taxpayers paid out $124 billion while the thrift industry itself paid $29 billion. (FDIC Banking Review, volume 13, no.2, December 2000) So there is a false notion that the banks underwrite their own members’ losses. In fact, the public bears the brunt of the losses when bankers are reckless. Sheila Bair, FDIC chief, is trying to get US bankers to begin loaning money again. But to do so bankers must begin to assess the worth of real estate at more realistic values. Then the real value of their asset package would be revealed and the banks would all collapse. Furthermore, if banks begin to loan money under their fractional banking scheme (banks loan out 10–50 fold more money than they have in reserve), then massive inflation will likely result. This would not only result in Americans bearing the brunt of higher cost of goods and services, but it could trigger Asian banks, seeing their savings devalued, to sell off their stash of US treasury bonds. America as a debtor nation depends upon billions of dollars every day, loaned from Asian banks, to stay afloat financially. The FDIC's Bair is aghast at American bankers shift away from traditional sources of revenue backed by collateral to risky investments. Bair wants to charge banks additional fees tied to risks when their business expands beyond traditional lending, such as stock trading. This idea hasn’t advanced in Congressional committees yet. American bankers are walking a tight rope with their depositors’ money. The mother of all bank runs? Now if just a small portion of American bank depositors hear that the FDIC had to tap into the US Treasury for funds, and these depositors feel their banked money is at risk and want to withdraw some of it, the mother of all bank runs could ensue. This could create the day of reckoning that many have predicted. A short banking holiday would have to be declared and who knows what happens from there – troops in the streets, issuance of new currency, martial law? Don’t think those in the Federal government haven’t made plans for such an occurrence. Of surprising interest, the FDIC reveals that millions of Americans don’t trust or don’t use banks. These Americans have been called the unbanked or underbanked, meaning that they "do not have access to banks or are not fully participating in the mainstream financial system," says the FDIC. The FDIC guesstimates that 10 percent of American families are "unbanked." That’s a lot of capital the banks don’t have access to. Those who hold currency outside of banks are anathema to the gods of banking. 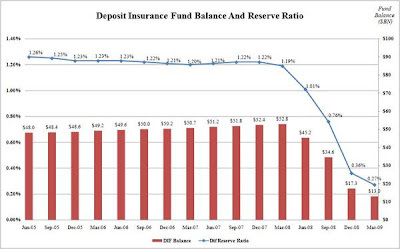 Sources: Alison Vekshin, FDIC May Add to Special Fees as Mounting Failures Drain Reserve, Bloomberg News August 20, 2009; FDIC 2ndQuarter report 2009.